Jan. 6, 2 p.m. & 7:30 p.m. Success, for most dancers, is achieved by joining a full-time professional company.Having the chance to simultaneously choreograph one's own work (and have it performed) is a rare opportunity at best, but for the nine talented members of Utah's Repertory Dance Theatre, that dream is not only a reality; it is built into the very core of their company's mission. RDT Executive and Artistic Director Linda C. Smith is perhaps the best person to explain this unusual opportunity. One of the original eight members hand-picked to start the company in 1966, Smith was able to help establish the unique environment that continues to encourage creative expression from within the company's core. "Our mission was to preserve and perform modern dance treasures without being beholden to a single choreographer and to nurture the art of choreography," Smith told City Weekly in a 2015 interview for the company's 50thanniversary season. Today, that mission is revisited annually with Emerge, an evening devoted entirely to works created by the RDT's current dancers. This season's production includes duets, solos and group works by Efren Corado Garcia (Collateral Beauty), Justin Bass (Doors), Lauren Curley (The Sum of None), Dan Higgins (Denizen), Lacie Scott and Jaclyn Brown (untitled) and Tyler Orcutt (Blue Sun). During most of the season, these performers are rehearsing with world-renowned choreographers (Zvi Gotheiner, Shapiro & Smith). For performers who are also being trained to think as choreographers, these sessions are not only lessons in how to perform steps, but also in how to create a performance. "We get to learn how they conduct studio rehearsal," RDT company member Dan Higgins explains. "We are always talking with them about what is driving their piece. We get to investigate the background of each dance." And often, the final works incorporate the dancers' own interpretations and movements. Higgins joined RDT in 2014 after receiving a BFA in dance performance from the University of Wyoming in Laramie. 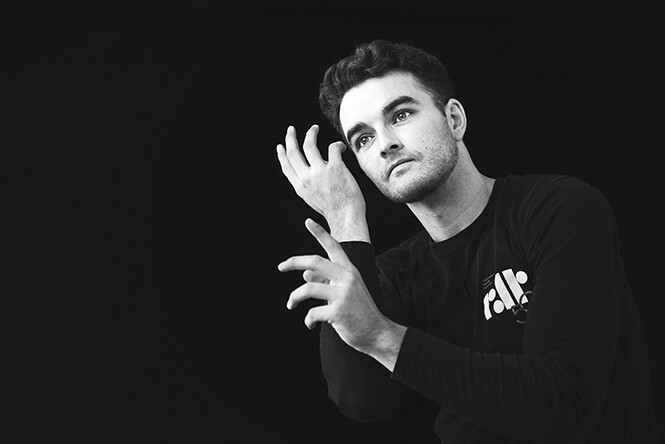 In the three years between graduating and becoming a professional dancer, he has been establishing himself as a choreographer with pieces showcased at the Salt Lake Fringe Festival and venues throughout Utah, Montana, Idaho and Wyoming. For this year's Emerge, Higgins has created a duet called Denizen. "It's an adaptation of a section from an hour-long work that I will be premiering at my own independent show in February," he says. "[For Emerge], I kind of stripped [the piece] down. We've been trying a lot together and seeing what we like. Duet work can be challenging, because I can't be two people at once and I need a partner I trust, someone who will make good decisions." On the other hand, Higgins says, the nice thing about doing it as a duet "is it can be more suggestive. The dancers move as one, with the same mind and perhaps the same body." The versatile experiences dancers like Higgins gain during their time with RDT—as teachers, performers and choreographers—have launched successful creative careers that continue long after the dancer moves on from the company, forming a richly talented pool of alumni, many of whom return to pass on their own choreography to later generations. Recent returning alumni who have contributed work include Lynne Wimmer (professor at the University of Southern Florida), Bill Evans (founder of Bill Evans Dance Co.), Francisco Gella (an independent choreographer in Los Angeles) and Angela Banchero-Kelleher (an associate professor at UVU). And while not every RDT dancer or alumnus is equally drawn to choreographic pursuits, for the time being Higgins' appetite for that part of the creative process is strong. In addition to his contribution in Emerge and other small local and regional invitations, he is currently applying to choreographic festivals in Bulgaria, Scotland and around the United States. He was also recently approached by a new dance company in Cheyenne, and invited to create a work this summer for their second season. Work keeps popping up and, he says, it all goes back to his connection with RDT. Despite his success, Higgins admits that it's challenging becoming a choreographer. "The craft takes time and energy—you are constantly thinking a lot about the process. You have a plan of action but, like anything else, you also kind of have to figure things out as you go." Sometimes, the best things in the arts happen by chance. The continued success of Emerge, however, is no accident. Nurtured by the RDT legacy, these young dancers are more than ready to take the stage as choreographers in their own right.